Short pamphlet by the Solidarity Federation on the history of anarcho-syndicalism in the UK. Anarcho-syndicalism is a distinct school of thought within anarchism. It seeks to abolish the wage system and private ownership of the means of production which lead to the class divisions in society. The three important principles of anarcho-syndicalism are solidarity, direct action and workers' self-management. It focuses on the labour movement more than other forms of anarchism and looks to unions as a potential force for revolutionary social change, replacing capitalism and the State with a new democratically self-managed society. The origins of anarcho-syndicalism can be traced back to the First International, also known as the International Workingmen's Association (IWA), formed in 1864. The First International was a socialist organisation which aimed at uniting a variety of different left-wing political groups and trade unions that were based on the working class and class struggle. Anarcho-syndicalism was a development of the social aspirations most strongly held by the libertarian or anarchist wing. After the demise of the International and the period of repression following the defeat of the Paris Commune, there was a move by some anarchists towards propaganda by deed to bring about change. At the same time the Marxist political parties settled into a crude determinism that saw them simply waiting for capitalism to collapse under the weight of its own internal contradictions. Many anarchists though saw the futility of individual action that had alienated them from the working class and sought to re-enter and influence a re-emerging labour movement. These syndicalists were industrial activists, ordinary workers concerned with the day-to-day problems that confronted them. Syndicalism was not the creation of one particular writer, or group of writers, rather it was the name given to the practice of a group of social movements that emerged, in many parts of the world, between the 1890s and the 1920s. All of these movements, “revolutionary syndicalist”, “anarcho-syndicalist” or “industrial unionist”, had a common aim, the revolutionary overthrow of capitalism based on economic organisation and using direct, as opposed to political i.e. electoral action. They sought to establish a new social order, free from economic and political oppression. This, they believed, would only be achieved by action from below, so they discarded notions of capturing state power through parliamentary or revolutionary means. They rejected the idea of “theorising” as an abstract exercise. They did however develop a theory of syndicalism in another way, which was through the experience and practice of the workers under capitalism. This was an important aspect of syndicalist thought. The workers through their own experiences saw the true nature of capitalist society; that it is divided into two naturally antagonistic camps constituting class struggle. Syndicalists believed that any over-lapping between the classes must be prevented; that the working class must become sufficient unto itself. This characteristic has been called “ouvrierism” – coming from the French word for “workers”, which can be described as the rejection of intervention by ‘outside experts' and parliamentary intermediaries within the socialist struggle, and an exclusive reliance on mass working class experience and action. This is why the syndicalists saw the revolutionary union as the form of organisation to achieve change. The union should be, unlike the political party, wholly working class in character. It unites workers in their very quality as workers. Syndicalists took literally the slogan of the First International; “the emancipation of the workers must be the task of the workers themselves” and seeing, in the strike, the means to do this. Every strike, whether successful or not, was seen to increase the hostility between the classes and so stimulate further conflict. Strikes encourage feelings of solidarity and are a training ground for further struggles. The climax would be, after a long series of strikes growing in breadth and intensity, the revolutionary ‘general strike'. The anarcho-syndicalists also saw the need to combine the political and the economic struggle into one. They rejected pure economic organisation and insisted that the revolutionary union should have a clear political goal, the overthrow of capitalism and the state. The anarcho-syndicalists saw themselves as presenting a consistent programme of action. The strike, the natural form of conflict, was also the form of revolution. The union, the natural formation for battle in the class struggle, was also the core of the new society. Every strike was a step on the way to the final conflict; while the class war is waged, the future is being created. Anarchists realised they could not wait for the workers to come to them but had to go out into the labour movement themselves and take an active part in unions and in their affairs and participate in all strikes and agitations. Anarcho-syndicalism is often presented by many historians as a foreign idea that has no place within the British working class movement. While syndicalism attained its first manifestation in France with the founding of the Confederation Generale du Travail (CGT) in 1895, similar ideas were spreading in Britain which paralleled the French development. These ideas were taken up as early as 1894. An anarchist monthly, The Torch, was arguing against “plots and conspiracies” and that “spontaneous insurrection was an impossible event” and argued for the General Strike. Also early in 1893 Commonweal, a weekly run by anarchists from the old Socialist League, had urged direct action by miners during their strike, and during 1894 it was becoming increasingly concerned with tactics for the labour struggle. Criticisms were made of unions of which it was said were either too small to be effective or too big, with apathy in the branches and “uncontrolled officialism”. There was also fierce criticism of the Social Democrats who captured positions in the unions and then used them as a base for a political career. It was argued that they undermined the ability of the union to fight. After the end of the Boer War in 1902, propaganda activities increased and in London Sam Mainwaring, an anarchist veteran of the Socialist League published the pamphlet General Strike. In it he used his experience as a member of the London Trades Council to denounce trade union bureaucracies. The paper argued for revolutionary propaganda within existing unions as a way of promoting industrial unions and of overcoming the divisions- based on different trades - within workers' organisations. In Britain the progress of anarcho-syndicalism took a different course compared to continental Europe due to the development of British Trades Unionism that had predated both anarchism and Marxism. Britain was the first industrialised nation and so it was here that the first working class developed. As early as 1799 and 1825 Combination Acts were passed to try to prevent the growth of working class organisation. The first trade union with an explicit aim to overthrow capitalism was created in Britain in 1834. The Grand National Consolidated Trade Union (GNCTU) was formed with the aim of the complete replacement of capitalism and the system of competition with a co-operative system based on workers' control. The GNCTU also developed the earliest incarnation of the Social General Strike - the ‘Grand National Holiday'. The idea was that on a set day all the workers would put on their Sunday best and cease work. This would bring the capitalist system to a halt and enable the working class to gain control. The Grand National eventually collapsed before it could attempt to put its plans into action but its ideas were carried on within the British union movement. Many working class activists within the Chartist movement saw the weapon of strike action as a way of gaining political change, some even argued for a ‘Parliament of Industry to replace the House of Commons. So the basic ideas of anarcho-syndicalism can be seen as a definite trend within British working class thinking and by the beginning of the 20th century they were starting to gain ground. Discontent within the Marxist Social Democratic Federation (SDF) was growing due to the increasing reformism (the principle that democratic procedures provide the most suitable means through which to build social change) and the neglect of, even hostility to, industrial struggle, of its leaders. Activist workers attacked the “opportunist and chauvinist” backsliding of the controlling group. They felt their suspicions were confirmed by attempts of unity with the predominantly non-revolutionary Independent Labour Party (ILP) and by the qualified support given to the idea of socialist participation in capitalist governments. Many working class socialists, contemptuous of the cautious approach of the newly formed Labour Party and hostile to the SDF became attracted to the idea of anarcho-syndicalism. It seemed to offer them a way of using workplace organisation to positive effect in the fight against capitalism. The Labour Representation Committee (LRC) had been formed in 1900 and was to change its name to the Labour Party in 1906. Many working class activists were disgusted with the performance of the first Labour MPs as well as the “top-hatted trade unionists” that ran the unions, supported the Labour Party and worried about their own social standing rather than the need of their members. There was a gap between the workers and the union bureaucracies. The anarcho-syndicalists worked both within existing unions and in alternative industrial groupings to argue for a new form of unions, ones based on direct action and control by ordinary workers known as the ‘rank and file'. A famous union leader Tom Mann, one of the leading figures in the London Dock Strike in 1889, wrote The Way to Win, a pamphlet which argued that socialism could only be achieved through trade unionism and co-operation, and that parliamentary democracy was inherently corrupt. He began to publish the Industrial Syndicalist with the aim of creating some sense of co-ordinated syndicalist dialogue between activists. This aim was realised with the establishment of the Industrial Syndicalist Education League (ISEL) in December 1910. At its inaugural conference in Manchester many prominent syndicalists were in attendance and notably they included many anarcho-syndicalists. There were differences between the anarcho-syndicalists and the non-anarchist syndicalists as well as those who preferred to call themselves Industrial Unionists. The anarcho-syndicalists argued strongly that alternative unions needed to be created although the majority were opposed to setting up these unions immediately. Attempts were made by Industrial Unionists to set up a union organisation based on the American model of the Industrial Workers of the World (IWW) but these were unsuccessful as the IWW was a response to a particular set of circumstances. The anarcho-syndicalists advocated working from inside the established unions. That is to say they would remain members of and work within them to push forward their ideas. They would also work outside the constraints of the union structures to develop their ideas and strategies. The anarcho-syndicalists clearly saw the need for workers to organise on industrial, not craft, lines, and combined this with a very specific approach to power and decision-making. This approach was to ensure that power should rest with the ordinary workers. These ideas were in keeping with the practices of the continental syndicalist movements, especially the Spanish CNT with whom there were many contacts. Anarcho-syndicalism was also developed and strengthened by Jewish immigrants who brought their anarchist ideas and applied them to their efforts of Union organisation. Leeds, Liverpool, Manchester, and especially the East End of London, had active groups and provided a basis of support. The ISEL was to give syndicalists a point of reference during the next few years. It ended the isolation experienced by syndicalists and through its propaganda campaigns helped to spread syndicalist ideas during the labour unrest of the following years. As industrial conflict grew syndicalism became a national issue. The period 1910-1914 saw an unprecedented wave of strikes in Britain. The mines, docks, the transport and building industries all saw major strikes that were to involve troops being used against strikers and there was a general strike in Liverpool. In these strikes the initiative was often taken by the ‘rank & file' workers who were to push their unions at a faster pace than the unions found acceptable. They formed strike committees that took control of the strikes away from the union bureaucrats. 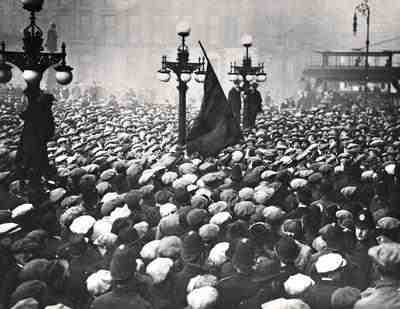 The syndicalist influence was felt throughout this time and anarcho-syndicalists were prominent, for example in the Liverpool transports strikes of 1911. Syndicalists were especially influential on the railways and after the national strike of 1911 quite a number of branches gave active support to some of the Syndicalist policies. In the autumn of 1911 there appeared a monthly journal called the Syndicalist Railwayman. One of the main items in the syndicalist propaganda was an attack on the demand for nationalisation. Syndicalist rail workers maintained that it would not greatly improve the lot of the railwaymen. Real emancipation would only be achieved when the railwaymen had complete control over the industry. And this could be achieved only through industrial unity and ‘direct action'. The outbreak of WWI saw an end to the early 20th century wave of unrest. One breakaway syndicalist union, the Building Workers' Industrial Union, formed in August 1914, found its anti-militarism made it a target for the state and it was quickly suppressed. During the war many syndicalist became involved in the Shop Stewards and Workers' Committees that sprung up in defence of workers' rights. These were especially prominent on Clydeside and in Sheffield and a National Conference was held in Manchester in 1916 and the Shop Stewards & Works Committee Movement (SSWCM) was formed in 1917. With the beginning of the Russian Revolution in 1917 many syndicalists began to turn towards support of the Bolsheviks and join the newly formed Communist Party. However some quickly became disillusioned with the central directives of Moscow and especially the instructions to affiliate to the Labour Party. After returning from the 2nd Congress of the Comintern the SSWCM split with a minority rejecting the Bolshevik strategy and eventually the Communist Party was to become the dominant political focus of the left in Britain. Syndicalism became a dwindling force within the labour movement so by the time of the General Strike of 1926 its influence was mainly felt in some of the attempts to create alternative structures under direct control of the workers. Interest in anarcho-syndicalism began to revive with the onset of the Spanish Revolution and Civil War. Emma Goldman, a famous anarchist, was in London during this period and wrote about the activities of the CNT. At the end of the conflict some Spanish Exiles came to London and helped inspire the small number of anarchists during WWII. At the end of the war the Anarchist Federation of Britain (AFB) was formed and started to produce Direct Action from 1945. Although not specifically an anarcho-syndicalist organisation it was heavily influenced by anarcho-syndicalist ideas and was considering joining the International Workers' Association (IWA), the anarcho-syndicalist international. In 1950 the leading lights of the AFB formed the Syndicalist Workers Federation (SWF). The SWF began by attacking the Labour government and its nationalisation proposals. It also forcefully made the point that, even if nationalisation was extended to all industry, it could only result in state capitalism. Far from promoting workers' control, it was argued this would allow a new “boss class” to emerge, whose power would result in control over rather than workers' ownership of industry. They argued that workers within the nationalised industries would soon find their conditions and wages lagging behind the private sector. Instead of supporting nationalisation, they argued, workers should organise on the same basis of class struggle, irrespective of whether the workplace was in state or private ownership. The SWF attempted to link workplace militancy to a revolutionary perspective and it consistently argued for independent industry-wide unions to both co-ordinate day to day struggle and pursue the long term aim of replacing capitalism with a society based on direct democracy and workers' control. Moreover, it also called for workers to organise internationally, keeping alive the anarcho-syndicalist international (International Workers' Association). Eventually, exhausted from years of struggle against the dominance of the Communist Party and trade unions, the SWF shrunk and by the mid 70s consisted of one group in Manchester. However the death of Franco in 1975 and the re-emergence of the CNT in Spain sparked the foundation of the Direct Action Movement (DAM) in 1979 and its founders included the Manchester Syndicalist Workers Federation. The miners' strike of 1984-85 showed the relevance of syndicalist ideas for the British working class. The excellent work done by DAM members won them the respect of many striking miners. The middle to late eighties saw a number of other disputes that the DAM supported, including Kent Messenger, Silent Night Traders and the printers at Wapping. In response to a strike at Ardbride's DAM members mounted a consumer boycott of Laura Ashley, its chief customer, which was later taken up internationally through the IWA. The DAM was also involved in a number of campaigns where it had an influence arguably disproportionate influence to its modest numbers. In the anti-Poll Tax movement, the only challenge to the Militant Tendency, a Trotskyite group that had infiltrated the Labour Party, came from the DAM. Needless to say, others who hadn't heard of the Poll Tax before Trafalgar Square were quick to claim responsibility. Nor will it surprise us when the historians say these organised it! DAM also played a role in the re-launching of the Anti-Fascist Action organisation. All these experiences led the DAM to develop a new industrial strategy based on direct action, workplace assemblies, and strike committees. The first step was to form ‘industrial networks' of activists in industries whose long-term aim was to form an anarcho-syndicalist union. A pamphlet, Winning the Class War, was published in 1991 and the continued development of the Industrial Networks led to the creation of the Solidarity Federation in March 1994. The Solidarity Federation, also known as SolFed, is a federation of groups and individuals across England, Scotland & Wales. Everyone involved is helping to build a non-hierarchical, anti-authoritarian solidarity movement. It is organised into ‘Locals', groups based on geographical area. SolFed Locals put solidarity into practice and organise and get involved in local campaigns across a wide range of issues – both in the community and in workplaces. Issues are extensive: defending our natural and local environment and health; opposing racism, sexism and homophobia, anything which defends or contributes to our mutual quality of life. Apart from being the name of the SolFed magazine, direct action is the tool which Locals use in all their work. At a basic level, this can be simply the spreading of information through leaflets, local bulletins and public meetings to raise awareness and involvement locally. However, direct action is not limited to spreading information. It means taking action to defend and promote a better quality of life. Fundamental to direct action is the fact that we can only rely on ourselves to achieve our goals. While we reserve the right to take opportunities to fight for improvements to our quality of life now, the solidarity movement remains independent from those we are demanding from. The Solidarity Federation accepts neither leadership, charity, nor guidance from government or business – instead, we fix our principle of solidarity with the practice of self-reliance. Solidarity Federation members who work in the same work sector have formed Networks. Their purpose is to promote solidarity amongst workers. They encourage the use of direct action in the workplace to fight for better pay and conditions with. The networks and individual members work within the present unions as well as outside and beyond them trying to form a basis for a completely new labour movement. As Locals and Networks grow, they practise community and workers' self-management. Eventually, industries will be run by producers and consumers. In other words, by workers (in Networks) and people in the wider community (Locals), who want the goods and services they provide. Capitalism is international, so we need to be organised globally to oppose it and build a viable alternative. Nationalism and patriotism lead to pointless and false divisions, used as tools to justify economically based wars. The Solidarity Federation opposes both in favour of a movement built on global solidarity. Solidarity Federation is the British section of the anarcho-syndicalist International Workers' Association (IWA). This gives it essential international solidarity and experience from much larger sections, such as the CNT (Spain) and USI (Italy). Founded in 1922, the IWA has a long history of solidarity in action; by the 2nd World War, over five million people worldwide were affiliated. A combination of war, fascism, and soviet ‘communism' all but destroyed the movement, but after the Spanish CNT re-emerged in the late 70s, the IWA had a new lease of life. Today, there are sections ranging from a few dozen to thousands of members, and it is growing. Most labour historians have overlooked the influence and importance of anarcho-syndicalism. Its advocates were ordinary workers and industrial activists, concerned with the day-to-day problems that confronted them. They rejected the idea of ‘theorising' as an abstract exercise and did not have the time, or the inclination, to write long academic theses or books which have in the recent past been the mainstay of documenting ‘history'. Anarcho-syndicalism has appealed both to workers within existing unions and to unskilled, non-unionised sections of the work force. This influence goes beyond traditional limits of labour history which tends to be written around the history of trade unionism and does not deal with the autonomous history of the working class. Some academics and middle class theorists have attempted to dismiss anarcho-syndicalism as ‘confused thinking' by some sections of the working class who cannot adapt to change. Others have seen it as a primitive forerunner to a more ‘coherent' and ‘sophisticated' form of socialism – Bolshevism. Syndicalism's anti-intellectual stance, ‘ouvrierism', rejected outside experts and professional politicians in favour of a reliance on mass working class experience and action. Therefore anarcho-syndicalist history and theory is not to be found in books in libraries but in the pages of its papers and magazines, leaflets and propaganda and in the collective experiences of those who continue to work within its principles.